JUNEAU – There are four days left in the first session of the 29th Alaska Legislature and vital legislation called Erin’s Law is still stalled in committee. Erin’s Law could immediately empower children to protect themselves from harm. SB 37 is just one of the four Erin’s Law bills filed this session. All four are still stuck in committee and have not advanced to either the House or Senate Floors. 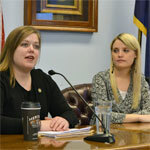 Representative Geran Tarr (D-Anchorage) first introduced Erin’s Law legislation last year but the companion bill in the Senate ultimately failed to pass the House after unanimous support in the Senate. Rep. Tarr renewed her efforts to pass Erin’s Law by prefiling House Bill 23 before the start of this legislative session. Erin’s Law is needed to address the disturbingly high number of child sexual abuse cases in Alaska. The Office of Children’s Services is reporting there were 290 allegations of child sexual abuse in March. There have been a total of 1,592 child sexual abuse allegations since the start of the school year. For more information about Erin’s Law contact Rep. Geran Tarr at (907) 465-3424.